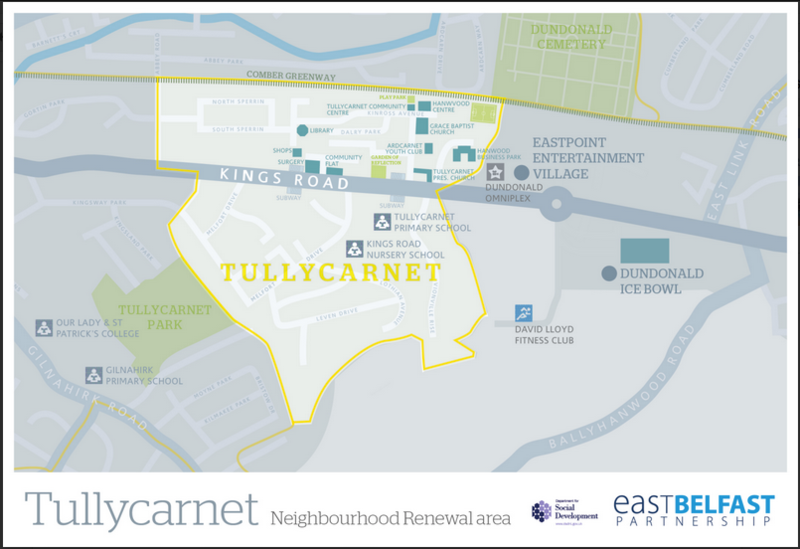 Tullycarnet Neighbourhood Renewal Area covers the Tullycarnet ward, which is located on the outskirts of east Belfast. The ward is currently situated within the boundaries of the Eastern Health & Social Services Board and the South Eastern Education & Library Board. The Neighbourhood Renewal Programme continues to support a wide range of groups delivering key services in Tullycarnet. This includes services for children and families, support for local health projects and a community safety project targeted at isolated elderly people. Neighbourhood Renewal funds have been helping to transform the area with support for the ambitious capital project, the Hanwood Centre. This provides office space, meeting rooms and a 24 station IT suite; 25 offices for start up/business units and a state of the art third generation floodlit synthetic sports pitch and community gymnasium. Click to see current members of the Tullycarnet Neighbourhood Partnership and relevant subgroups.